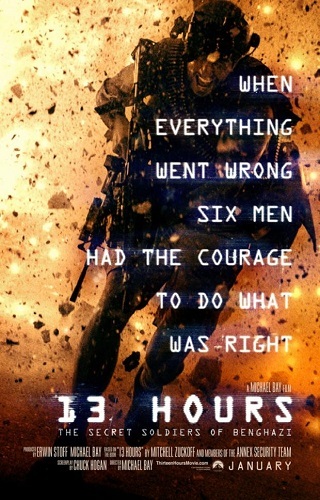 Michael Bay’s 13 Hours: The Secret Soldiers of Benghazi delivers a fictionalised account of the 13 hour siege of a U.S. Compound in 2012. The film follows Jack Silva (John Krasinski) with support from Tyrone “Rone” Woods (James Badge Dale), Kris “Tanto” Paronto (Pablo Schreiber), Dave “Boon” Benton (David Denman), John “Tig” Tiegan (Dominic Fumusa) and Mark “Oz” Geist (Max Martini). They are CIA agents tasked with supporting the tense situation in Benghazi and find themselves on the front line of a horrific siege. Michael Bay is forced to be a lot more restrained than he is used to in this film as he has nowhere near the budget he would use on a Transformers film. None of this looks cheap or low budget but it’s worth noting that he’s working with a far smaller pot of money than he normally des. This broadly works in the film’s favour as more care has to be taken to build tension and establish the situation without resorting to an endless stream of moneyshots. There are plenty of fireworks of course but there are also a lot of quieter moments to help add some variety to the narrative. It’s something of a double edged sword as similar techniques to build the atmosphere are used over and over again which makes them come across a bit like white noise after a while. Part of this can definitely be attributed to the bloated runtime that makes the overuse of these methods all the more obvious. The film is definitely too long. It seems to be a fact that Michael Bay is incapable of making a film that runs under 2 hours. That wouldn’t be a problem if he was able to pace it properly so that the running time doesn’t feel long when watching it. Sadly that isn’t the case as evidenced by the significant pacing problems this film has. Most of these are present in the first hour where the task of establishing the characters and the situation is stretched out to the point of boredom and Michael Bay’s trademark juvenile fratboy humour turns up more frequently than is comfortable. Smartly the narrative largely avoids the complex politics of the situation using walls of text to set the scene in the beginning. Michael Bay is not known for his subtlety or cultural sensitivity so this was definitely best avoided in a film directed by him. Instead the focal point is the people who were in the situation and how much of an effect it had on them. All told the film does a pretty good job of developing the characters. They are a bit thin on the ground but enough information is given to make do and invest in them to varying degrees. There are lots of scenes where they speak to their families back at home in an obvious attempt to create sympathy that way. It’s a fairly standard technique but it does what it needs to. The actors all do a capable job with particular attention given to John Krasinski who is definitely a far cry from his days playing Jim in The Office. He shows that he is very capable of leading the cast and comes across as very believable as an expert combatant. One thing that lets him down is that he disappears for a long stretch of the film which really doesn’t help build him as the central protagonist. Most of the other characters fade in and out as they are needed. James Badge Dale is memorable when he appears and I enjoyed Max Martini’s contribution despite the fact that it was very limited. As you might expect from a Michael Bay film, the action is expertly crafted. Love him or hate him, the guy really knows how to frame a coherent and exciting action sequence. The extended siege sequence built suspense in a really effective way and I was never in doubt about what was going on. It could be said that this film is a bit of a surprise in terms of what is expected from Michael Bay. People are used to his Transformers movies and are quick to criticise them for the notable missteps they take. Personally I enjoy those films despite their many flaws and would say The Rock is a genuinely great film. I hope this film marks the start of a Michael Bay who is starting to grow up a little with his film making. It certainly comes across as being what he is trying to do. An entertaining film that suggests that Michael Bay is starting to grow up as a film maker but doesn’t shake all of the negative habits. Michael Bay is forced to be a lot more restrained in this film than he would with a Transformers film as he is working with a much smaller pot of money than usual. None of it looks cheap or low budget but it is worth noting nevertheless. Generally this works in the film’s favour as more care has to be taken to build tension without using an endless stream of moneyshots. This does mean that similar techniques to build the atmosphere are used over and over again which makes them come across as white noise after a while. Part of this can be attributed to the bloated running time. The film is definitely too long. It isn’t paced well enough to justify the running time. Most of these issues happen in the first hour and Michael Bay’s trademark juvenile fratboy humour turns up more than is comfortable. Smartly the narrative dodges the complex complex politics of the situation as Michael Bay’s lack of subtlety or cultural sensitivity would not have done this justice. The focal point is on the people involved and it was the right decision in this case. In general the film does a good job of establishing the characters. They are a little thin on the ground but enough information is given to make do and invest in them. There are lots of scenes where they speak to their families back home in an obvious attempt to create sympathy. It’s fairly standard but does the job. John Krasinski proves to be a capable leading man but the fact that he disappears for long stretches of the film does him no favours. Most of the others fade in and out but come across well when they do appear. As would be expected the action is expertly crafted. The extended siege sequence builds suspense in a really effective way and I was never in doubt about what was going on. In some ways this film is a surprise considering Bay’s output in the past few years. I feel as if he is trying to grow up as a film maker and this film signifies the first real attempt at that.